(n. p.), 1861. 1st printing (presumed). Now housed in an archival mylar sleeve. Upper left tip lacking. Small stain to center of ballot. A faintly penciled name, "Hugh Kev (?)" Very Good.. Single sheet leaflet of flimsy blue paper, printed recto only. 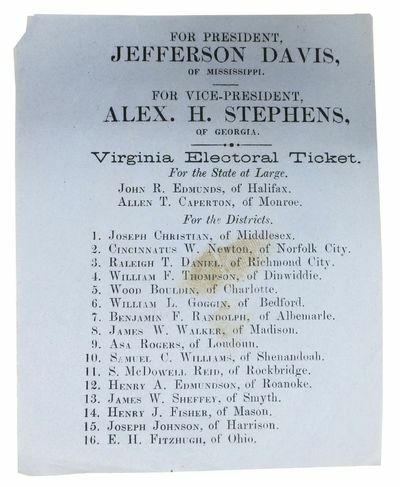 27 lines of printed text, with the bottom 16 listing candidates for the divers state districts. 5-1/16" x 4-1/16"